I went out to dinner last at a new Korean restaurant in town, Happy Teriyaki, followed by dancing to a popular local cover band, The Delta Knights. The drummer, Larry is a warmhearted large black man, who exudes calm, and has endless talent. He took a liking to Sam many years back on a summer’s day when we saw them play an outdoor venue. He gave me child rearing tips then, impressing upon me how important it would be for Sam to know his musical heritage as part of his cultural background. Last night Larry was dutifully impressed by pictures of the boys that I thrust at him, nearly knocking over the drum set to do so, when we arrived minutes before the set began. I was wearing a new pair of just under the knee zip up black boots that were a hybrid of a cowboy boot, and a fancy boot. Add to this ensemble the black tights, and the new a-cut blue jean skirt from the Goodwill, and a long sleeved black shirt, and you have Mama C looking rather splendid. Happy Terriayki, if you are ever in Portland, Maine is just about the most exquisite and unknown place I’ve ever been to. The wife is Korean, the husband is Japanese. They have both been cooking for over sixty years combined, and every morsel carried that rich flavorful message with it. One of the evening’s hosts-Annie-an American woman who speaks Korean and who lived in Korea for twenty years explained, with the owner’s guidance all the choices before us. The menu is broken into Korean and Japanese dishes. Annie’s adopted Korean daughter considers the owners and their children to be her extended family. Joining in on the educational component of the night she identified many of the ingredients (that is bean curd, rice cakes in their solid form, a kind of root…) and the rituals and traditions surrounding various components of the meal. It is an honor to drink this, it comes from the water used to remove the rice form the pan chilled and mixed with brown sugar. She came over to us novices throughout the meal to guide us towards the pinnacle of this authentic Korean culinary experience. I was struck by how this larger family of the restaurant, and her adoptive family all wove a net of inclusion around her graceful self assured presence. She is a senior in college now. I have known her since elementary school. I imagined Sam at that moment fifteen years from now and felt humbled again with the knowledge of how much there is to do to help him reach his own racial and cultural grace and ease as a young black man later in life. After the meal, Eli, the Japanese base playing-turtle raising-chef sprung one of the turtles to walk around the restaurant to wish us well on our next phase of the night. This gathering to celebrate my dear friend Ronda’s birthday was just getting started! As I was cutting it up on the dance floor an hour later, with my hands over my head, or swishing over here while my knees were down low, and my smile was wide I felt free. Free from what? I don’t know. Free from the hyper vigilante state I feel like I am often in about one thing or another. Free from worry and fear. I didn’t even feel self-conscious about dancing alone, as all the partnered folks old and new found their four-footed fanciness next to mine. I reveled in their connections, and buzzed along in their joy. Free from want. I had it all last night, friendship, a full meal, community, culture, entertainment, safety. Freedom of expression-well if you had seen my dancing I certainly had that too. The dance floor, albeit mostly white, was not all white, for once in Maine. There were two mixed raced couples, a bisexual couple, and several white-haired couples (with more pizazz and grace than most of the rest of us) and the others all up there together shaking it. I do not mean to make light of Roosevelt’s Four Freedom’s here. I mean to notice the light when I am basking in it. Roosevelt said the people of the world ought to enjoy these four freedoms, and we were . (Freedom of religion not accounted for- although dancing to a Ray Charles tune with Larry and Aaron, the sax player was a religious experience to me. ) This morning feeling rested despite the late night and the mid morning arrival of the two boys into my bed I still feel great. 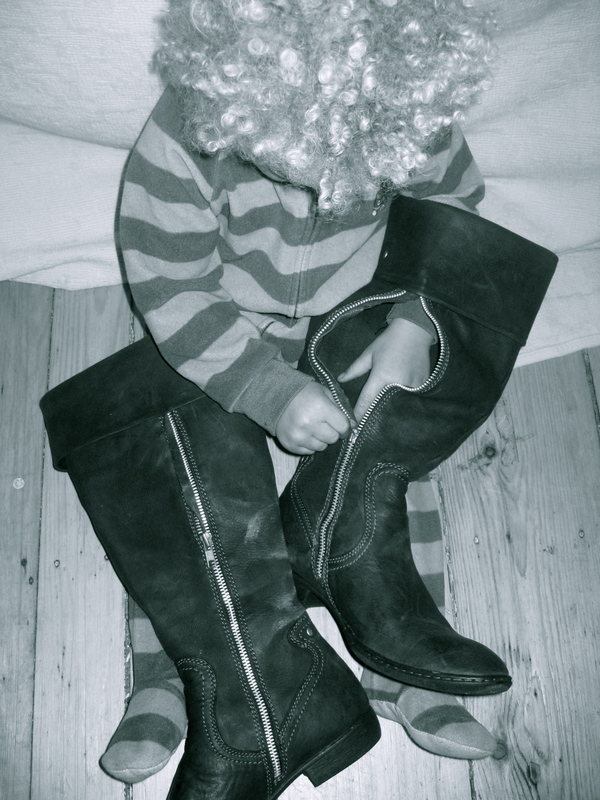 Marcel is on the floor, playing with the boots, imagining his own adventures to come. It probably involves riding dinosaurs and dancing with lady bugs. If those boots could talk they would recount over hearing the gentleman who said to me before I left; You and your boots were both smokin’. I was there, I witnessed the dancing. It was everything Mama C says, including the preamble about the great Korean food. Nice Blog Mama!